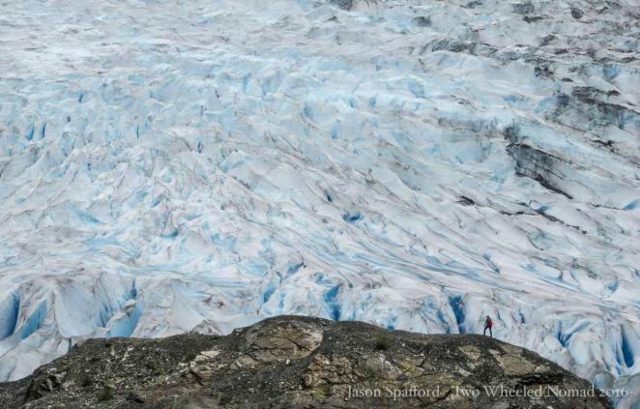 Where the city ends, Juneau Icefield in Southeast Alaska begins—and keeps going. 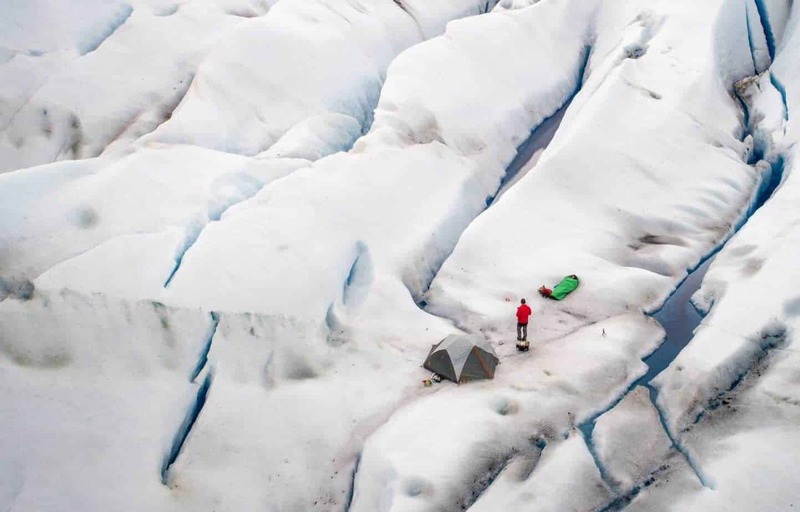 Undeniably, its centerpiece is Mendenhall Glacier, one of the world’s most accessible. 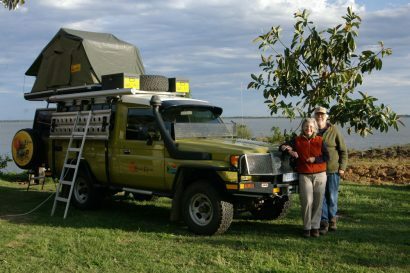 And the one we planned to make a self-guided trip and camp overnight upon in springtime. Just 12 miles from downtown and then a 4.5-mile moderate hike—steep and slippery in part—through undulating forest. Or, an hour’s easy paddle on Mendenhall Lake, depending on the absence or attendance of wind. You can be helicoptered there of course. 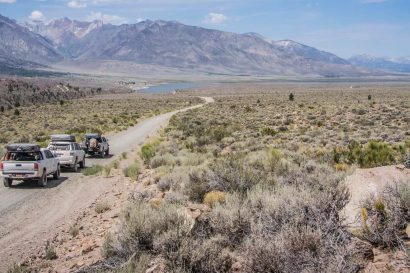 Although we’d hoofed it previously, having become fast friends with Josh, a kayak instructor, we hit the water without a second thought. Originally, the glacier had two Tlingit names: Sitaantaagu (Glacier Behind the Town) and Aak’wtaaksit (Glacier Behind the Little Lake). About 3,000 years ago it began forming but stopped growing in the mid-1700s. Because it’s rapidly receding today makes now a precious time to see quite the glacial vision. Despite Juneau being known as rain country, the sun shined down on us—even in the middle of a temperate rainforest. A fine start considering the soft drizzle that ordinarily falls on the coastal city, wetting the leaves and branches, then gathering into big drops which plop onto your head and arms. Hoping the weather would play nice, incredibly for April we encountered a warm breeze. Albeit a sporadic one from intermittent warm currents flowing over the glacier. That, while smiling through gritted teeth in the battle faced by my pipe-cleaner arms and core. Namely paddling on unsettled waters against a relentless headwind. Determined to make me earn it, I thought. Don’t the good ones always do? Grateful to be seated in a sea kayak, its displacement hull designed to power through the chop. 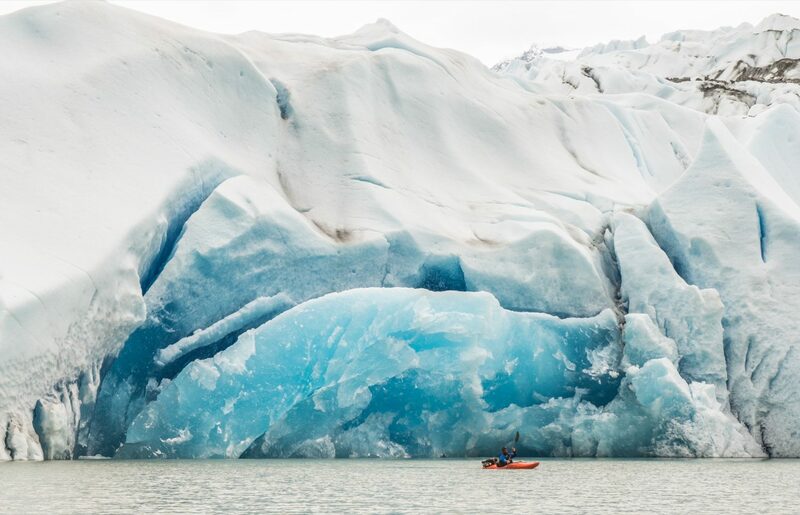 Cruising en route through an iceberg-littered lake, we meandered around the odd lump of floating ice—Mendenhall’s offerings to remind us of her constant presence. The three of us eventually made our way closer. Its face alone spanned about half a mile, rising 100 feet from the waterline. Truly, Mendenhall is a thing of beauty, with the light glistening on its towering spires, waves playing about its feet, and bald eagles saluting it as they sped by. Giving the glacier a healthy distance up close, we came head-on with an intimate, neck-craning vantage point of the wall looming above us. In half a heartbeat, Josh had taken his small river kayak and snuck into an opening. At a mere arm’s length from the imposing blue crystal threatening to come crashing down on him at any point. A bold strategy from a 20-something guy that to my mind was either unconcerned about his mortality, or possessed balls the size of church bells. Land based once again, we arrived without incident at the glacier with the clamour and excitement of the circus coming to town. The first thing I noticed was a glint in Jason’s and Josh’s eyes and the grins that went with it. I shrieked in excitement, snapped on the crampons, and leapt over the ice. 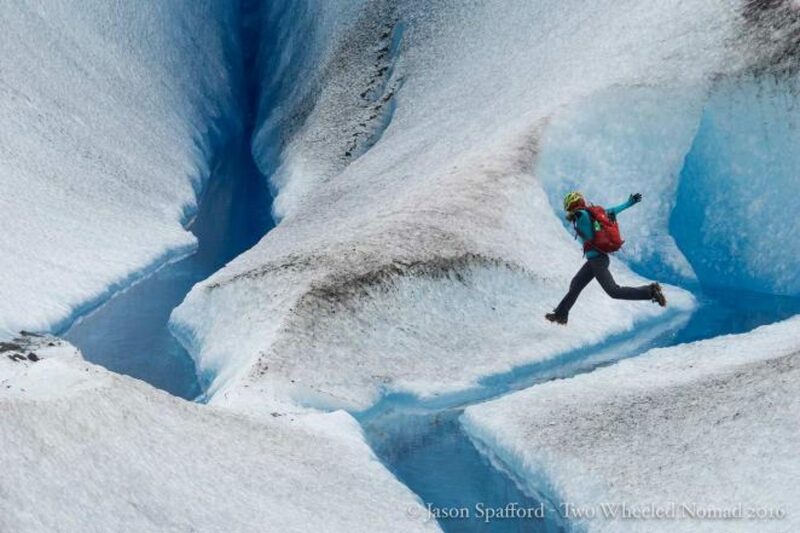 I had to chop out each step in order to get my footing on the brittle ice, lest I slip down the glacier and smash into the rocks below, or worse, go sailing over the edge into the abyss of a crevasse. 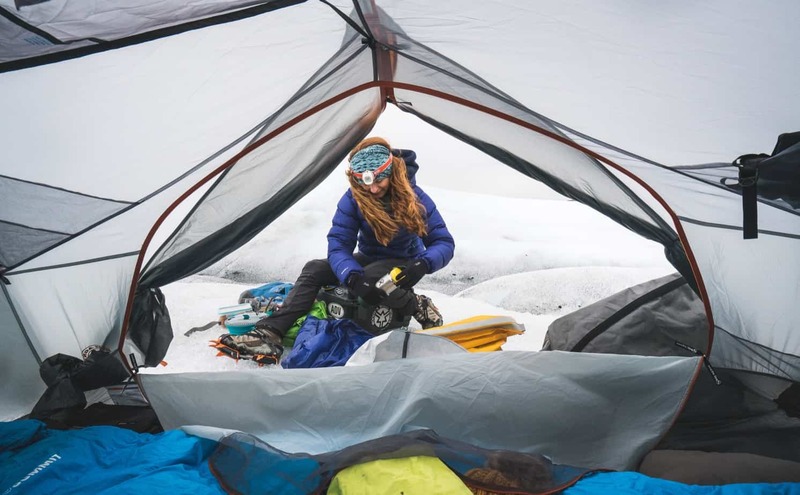 It’s only when we climbed atop the glacier, having clambered up and over a few peaks carrying everything we needed for a night on one, did we gain a sense of its enormity—more than we could see at a whopping 12 miles long. 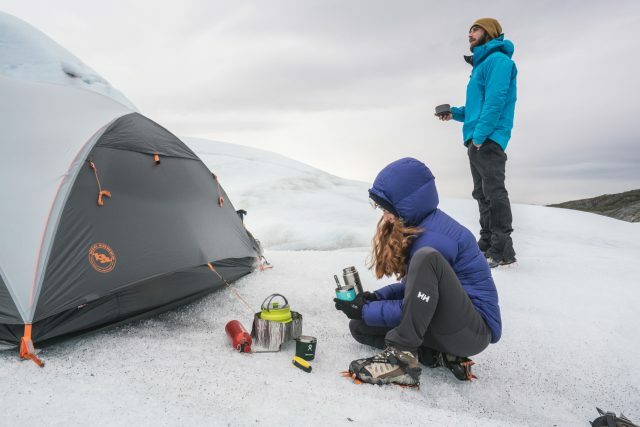 Gloriously, if there’s one thing camping on a glacier does, it makes you more alive to your senses than ever. 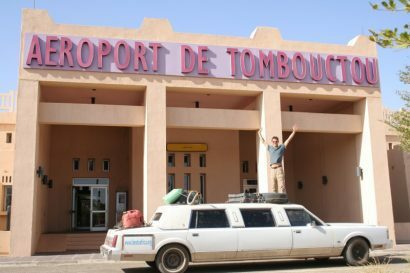 Although locating a flattish sleeping spot was harder than you might think. Still, nothing a wee bit of landscaping, courtesy of our crampon spikes in an Irish jig couldn’t resolve. 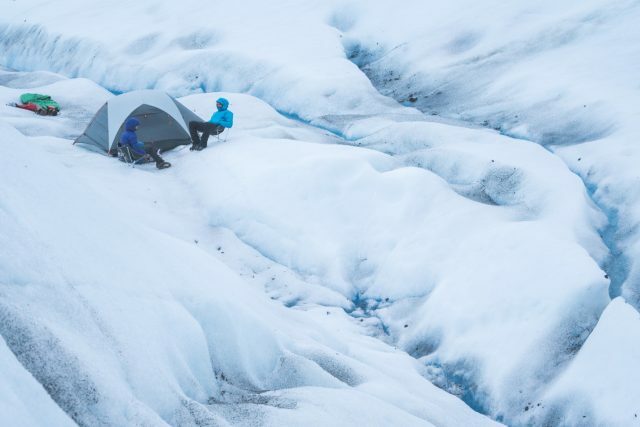 Far from methodical, we kicked into the glacier’s icy crust, rhythmic step by step. 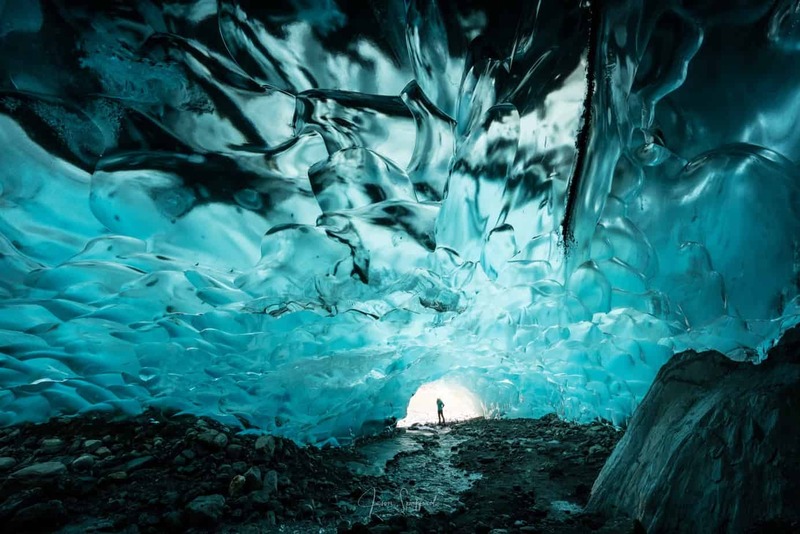 Lurking beneath was a vision of aquamarine blue colliding with emerald green: an ice cave. A partially hollow glacier, what its melting revealed was radically different, like a new colour in the rainbow. Where blue water ran over blue rocks, surreal lava-lampish images had been created. 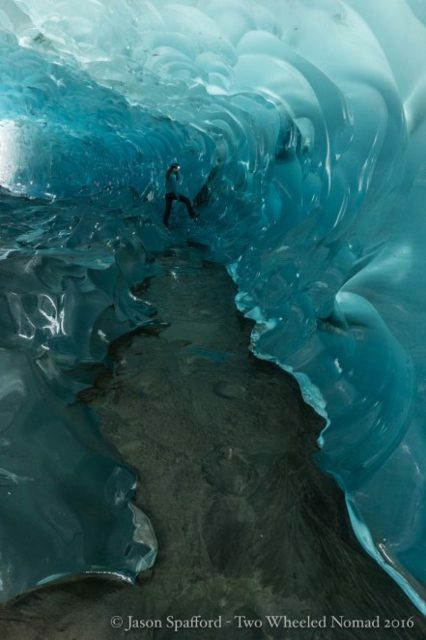 It was eerie, with swelling blue domes that resembled the underside of a rapid river, flash-frozen. The one we found was around 100-feet long and 30 feet wide. Relishing if not limiting our time in the adult playground—above which who knows how many tons of ice weighed down on us—wasn’t exactly conducive to a safe place. Somber and elated, I punched through the ice back to where we called home for the night. As omnipresent as the glacier was, I further sensed its waning, melting imperceptively by the minute all around me. Sometimes I passed places where I heard a gurgling, where the stream ran beneath, impossible to see. An icy wind started to rise, a swallowing nothingness determined to extract from me the last vestige of heat. By dusk, the glacial ice sparkled like glitter in the setting sun. It was a magnificent setting in its blazing splendour. Colour slowly leached out of the world and night fell. The air came alive with the sound of the wind whipping over the glacier, often groaning and rumbling. At other times it was profoundly hushed by the endless silencing ice. Everything but me seemed utterly certain of itself. A chilly night lay in store as my feet became chunks of ice, and cold seeped through clothes toward bone. Joyful but bushed in the Dome Sweet Dome, I hadn’t yet finished cataloguing the day’s events when I felt my eyelids closing, as tiredness sought to pull me under. It was bliss to lie unmoving, with the warmth of down growing about my goose-fleshed limbs, the small arches of back and neck and knees fading into the softness given by the cradle of the deep. Hovering on the verge of sleep, we all heard a BOOM! A colossal fragment of ice broke away with a resounding crack, reverberating through the cool air. Carving off the very thing I was sleeping on. Peace slowly returned in the eventual quiet of the night, and I fell at last over the edge of dreams. It was an uneven, and incredibly windy night’s sleep. But the view was so worth it. Back on the water the following morning, there it was! 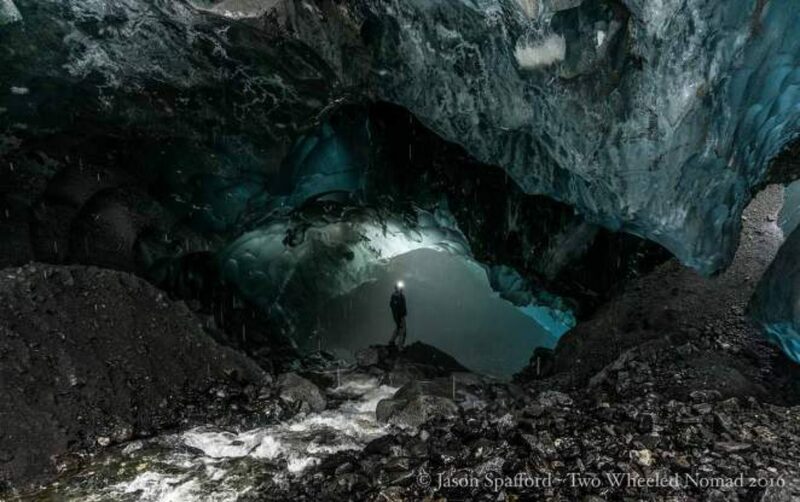 A great gaping hole in the glacier, where Mendenhall dispensed with a huge mass of ice in the night. Right where Josh had nestled his kayak in for a photo op just hours before—it was nothing short of incredible. Gradually, the vivid green of the Tongass, the glistening topaz ice, the way the light fell on the glaciated mountains, the waterfalls and flowing creeks had an effect on me. The experience had somehow plugged a gap in an appetite that I didn’t know I had. The part of me that saw and registered the world, chronicled this corner of Juneau in an inner ledger for posterity. I felt a sense of calm. A pure and noble side of the world. Even when the clouds did their usual and wouldn’t let up, the rain almost started to feel invisible. I let it beat on my head. I didn’t mind. As a Brit, rain was familiar. We’d won the lottery without buying a ticket, I thought. And all because of those we had fortuitously met—both wild and civilized—who were receptive to making people’s brains roar with excitement, life, and colour.